We have a variety of Aero Outdoor logo apparel including Vests, Short Sleeve T-Shirts, Long Sleeve T-Shirts, and Hats. Good looking vests to wear to town or on the hunt. Black, quality fleece, zippered vest with 2 front pockets. Aero Outdoors logo on front and DropZone logo on the back center top under the collar. 100% poly washable. Quality medium weight, pre-shrunk T-Shirts. Comfortable to wear year-round. New 4 color print process is breathable and flexible. We wore them and washed them to make sure of the quality. Did not shrink or twist, and kept their colors. Generously sized, 100% Quality Cotton, 4 color Long Sleeve T-Shirts. 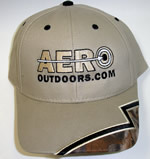 Whether in the blind, or off to town, you will look great in an Aero Outdoors logo hat.